This cover of an issue of The CCNY Student features an especially critical reaction to the ongoing Rapp-Coudert hearings of 1940-41. Produced by the American Student Union, a national left-wing student organization, the cover's illustration depicts covert surveillance, interrogation, silencing, and book burning. While the images may not be entirely reflective of reality on campus at City College during they period, it was meant to evoke what many felt was the college's concerted effort to supress free expression on campus. The headline beneath the image mentions the names of two City College instructors Morris Schappes and Abraham Edel who were required to appear at the hearings. The Rapp-Coudert Committee, a New York State initiative, was organized in June 1940 to investigate and identify "subversive activities" and persons in New York's public schools and colleges. Holding private hearings from September 1940 through December 1941, the group issued subpoenas to and interrogated more than 500 faculty, staff, and students suspected of Communist ties. City College, in particular, became a target of the committee with dozens of faculty and staff called to public and private hearings. By hearing's end, more than fifty CCNY faculty and staff would be dismissed from their jobs. 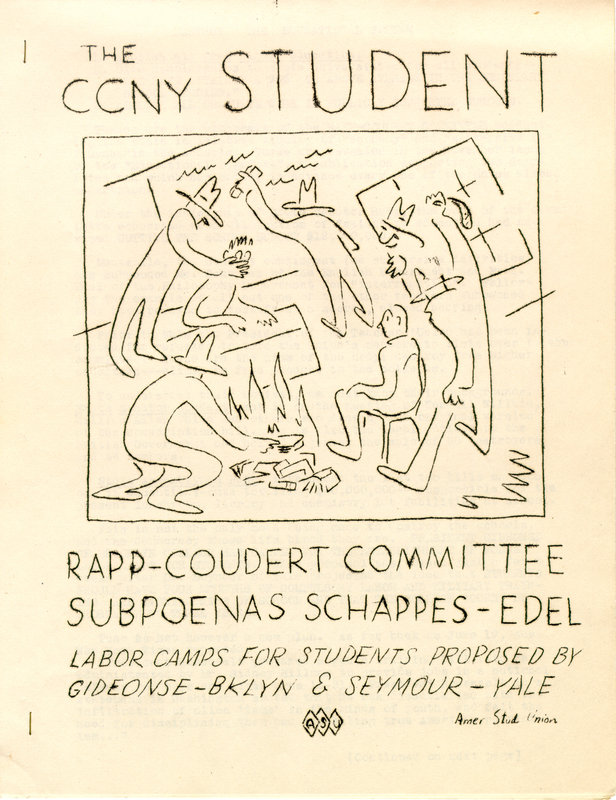 Cite This document | American Student Union, “"Rapp-Coudert Committee Subpoenas Schappes-Edel",” CUNY Digital History Archive, accessed April 24, 2019, http://cdha.cuny.edu/items/show/3952.